Have you ever thought about what it is like to live in a patriarchal society? In my country, men can cut the noses and ears off their wives and go without punishment. Here, women are brutally beaten and put to shame in public. In some other countries women are sold as slaves, sometimes traded between men for a pack of cigarettes. This is the society that I live in, where being a woman is shameful and women live in disdain or contempt. We should not tolerate it. In this society, everything is based on the desires and demands of men. How is this fair? Women are equal human beings and they should have the right to make their own choices, as men do. No gender should impose its choices on another. From my childhood up to now I have learned that men are more valued than women, and that women must respect and obey the laws of men. Men in the family are more respected even if the male is a boy much younger and less knowledgeable than you. A woman doesn’t have the right to plan her future, to choose her spouse, or even to decide whether or not to get pregnant. Women are used to serve and obey the desires of men. Some women are freer than others, but the number of free women is far fewer than those oppressed. Being a woman in this kind of society is frightening. Some years ago when I was a computer teacher my classes would finish in the evening. I was often frightened that I would be kidnapped or raped while walking home at night. I left my job for that reason. In this kind of society we need a strategy to make human rights work for women. Everyone has the right to live in a peaceful environment but in societies where there is war, conflict, and chaos, women and children become the first victims. I believe it is therefore the responsibility of human rights groups and the United Nations to support the victims and find ways to reduce violence. The United Nations must support the rights of women. 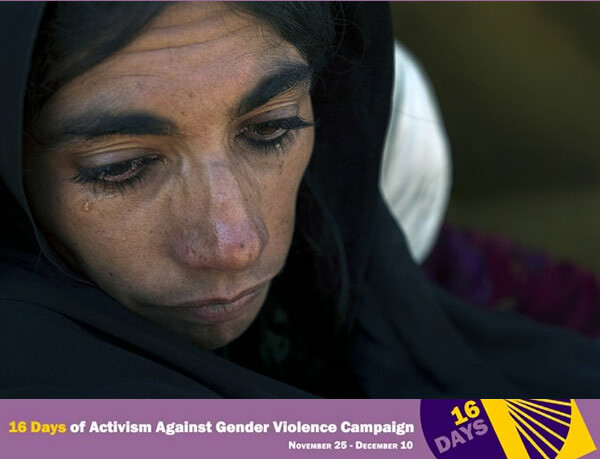 Meanwhile the government of Afghanistan must create a strategy to reduce violence against women. In remote areas of the country the men in power conduct courts that have no legal basis and credibility and punish people, especially women, for small “crimes.” They do not follow the constitution of Afghanistan, and they use brutal and inhumane punishments like death by stoning. These men who run these religious “courts” need to be punished publicly and women’s organizations must work hard to defend women. We need wide development of awareness and we need a national advertising campaign against violence. I am hopeful for the day that Afghan men will know the value of women and respect them as human beings and not just use women for their own purposes. Wonderful and insightful, Shekiba! It is hard to go through this experience and it takes a lot of courage to speak about it. Thank you for sharing it with us! Dear Shekiba, Your voice is so powerful! You have done such good work here, to educate the world. Thank you for your writing!